Nicky Ryan is Enya’s producer. He is married to Roma Ryan. 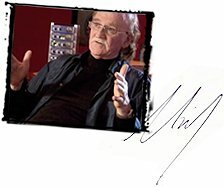 Prior to working with Enya, Nicky mixed live sound for Irish acoustic groups such as Planxty and Clannad. In 1980, during his period as Clannad’s manager, Nicky decided to bring Enya into the ranks. Nicky answered a couple of questions submitted by fans during the ‘Dark Sky Island’ promotional tour.